On Saturday (March 16), millions of people took to the streets across the globe in solidarity with those facing fear and hate in our communities from a growing and dangerous far right. And we did it less than 48 hours after the mass murder in Christchurch, New Zealand, of the Muslim faithful going about their peaceful business of Friday prayer. Just as was the case in Manchester, on London Bridge and outside the Finsbury Park Mosque, and with Isis across the Middle East, this is what intolerance, hate speech and vile ideologies lead to. 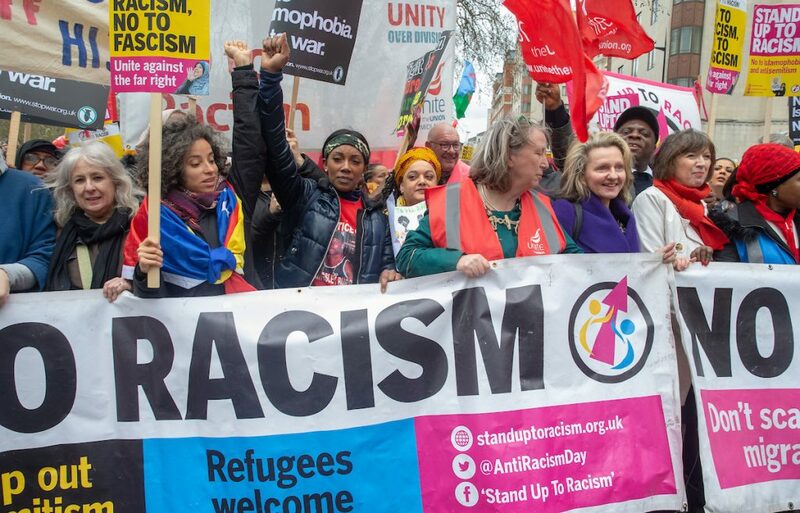 Here in Britain trade unionists are marching together with thousands of anti-racist and equality campaigners in London, Cardiff and Glasgow in solidarity with refugees and migrants, our Jewish community and the Windrush generation, Muslims and Latin Americans, all those fearing persecution and intimidation across the globe. We’re marching to mark the United Nations International Anti-Racism Day. Its key theme is countering rising nationalist populism and while it will always take more than demos and protests to achieve that, when the world is marching, society watches. But while society may be watching, we need to do so much more to engage in positive discussions and an alternative politics to address the genuine fears and concerns of millions facing growing poverty and isolation in breeding grounds for the sophisticated but simplistic and opportunistic narrative of hate and division being spewed from the likes of Stephen Yaxley-Lennon, Gerard Batten and Steve Bannon. 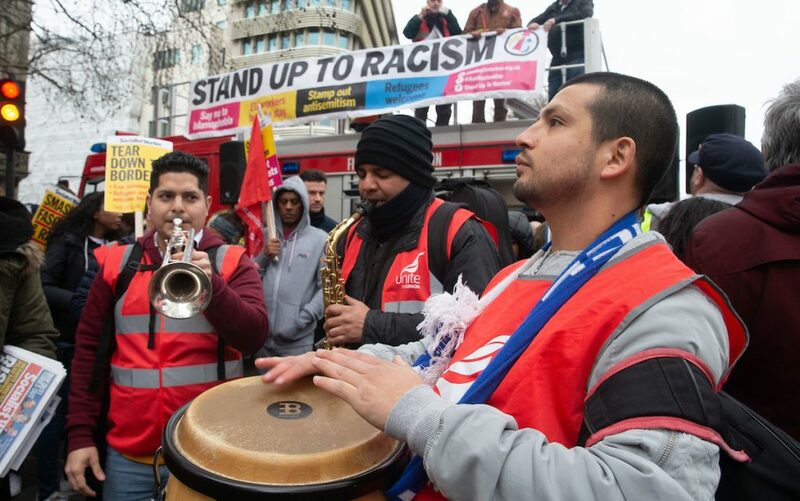 We as trade unionists have a responsibility and a duty to stand up on the streets and, as we have historically, in our workplaces, our homes, pubs and communities, if we’re going to defeat a dangerous and growing alt-right with an agenda beyond race or religious hatred. What we’re fighting isn’t just racism, and it’s naive to call it populism, at least in my book. It’s a well-financed and very sophisticated ideological attack on our fundamental values and democratic institutions, on our basic rights — our long fought for human and women’s rights, our trade union rights and religious freedoms. Hiding behind racism and Islamophobia, they offer simplistic solutions to the complex but genuine fears people hold, in order to disguise and build the dangerous politics of the far right. Across the globe we see growing oppression, regression of progress and intolerance of opposition from elected far-right governments. Our route in London on Saturday took us past the Brazilian embassy, representing a country where new president Jair Bolsonaro is embracing not just rising nationalist populism but a far-right ideology, praising the torture and killings of Brazil’s past military dictatorship and seemingly intent on cleansing the country of its left opposition. A country where opposition leaders are imprisoned and Marielle Franco, a politician campaigning to expose systematic police violence against the poor of Rio’s favela communities, is executed for her political activity by forces of the state. Brazil reminds us that we cannot, ever, take democracy for granted, no matter how deep its roots. And why international working-class and trade union solidarity is as fundamental today in our struggle against the rise of a new far right as it ever has been. Throughout history, wherever fascism and the far right have taken power, trade unionists have been murdered, organisations banned and collective opposition suppressed. They know, just as our employers, the political Establishment and right-wing media know, that unions are the first line of collective defence for working people, in defending social and political progress, fighting injustice and intolerance and organising collective resistance to oppression. Trade unions have always fought for and defended democracy, organised and powered the fights necessary for us to achieve the rights and freedoms we now enjoy. We must never let progress and working-class solidarity slip from our grasp. As a labour movement we must always be vigilant, both here in Britain and elsewhere, because across Europe and beyond we see the rise of those who despise us and the alternative vision of a world we stand for. 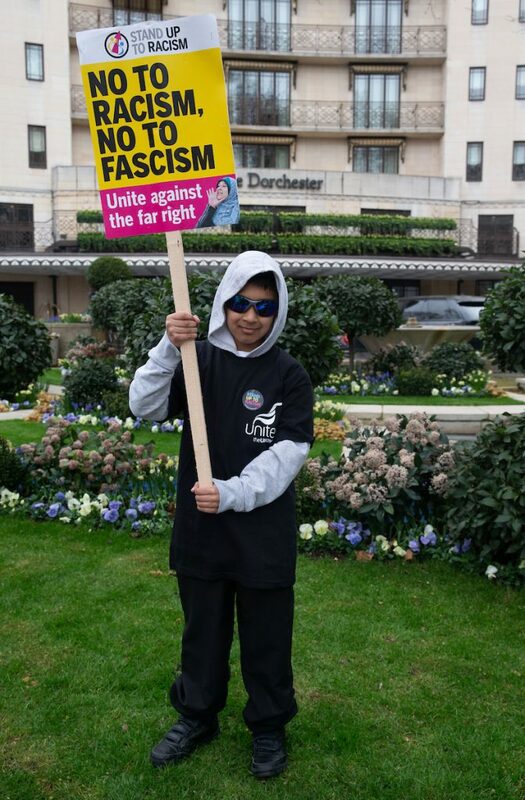 Ukip is moving ever further right, with Batten working openly with fascists in building a political wing for a dangerous far-right street movement — a move mirroring Hitler and Mussolini’s rise to power. Meanwhile the Tories in the European Parliament stand alone in supporting the racist, anti-semitic, anti-migrant government of Victor Orban in Hungary. And Austria’s Identitarians, the so-called “hipster right,” in a country in which a party founded by former members of the SS is part of government, are demonstrating how the far right has learned well from our left and anti-fascist campaigning, using well-funded high-end digital productions, music and emotional values to recruit supporters and promote action. And with yet another Spanish general election and European Parliament elections in the coming months, the threat of the far-right taking a significant proportion of seats is very real. Bannon has upped his prediction of the vote that “populist” parties will secure in May’s European Parliament elections to near 50 per cent, while Spain’s fascist Vox party has its eyes on both Strasbourg and Madrid prizes. Any illusion that Franco’s legacy somehow inoculated the nation from the return of the far right was shattered by the elections in Andalucia last December, in which Vox took 12 seats. I often hesitate to use the F-word — it’s too simplistic — but any party described as nationalistic populist, but congratulated on its achievement by Marine Le Pen, is fascist for me. Just as are the so-called “people’s parties” in Sweden and Denmark, the Netherlands and Germany, France, Austria, Italy and across eastern Europe. We, as a movement, have to recognise our responsibility, our duty to step up in the fight against the far right. Just as we stood against the fascists in Spain, Germany and Italy and forced out Oswald Mosley’s blackshirts here in Britain itself. We have a vision of a fairer, more equal society, of a tolerant, peaceful world in which everyone can fulfil their true potential as human beings. Upon the defeat of fascism, we fought to build a fairer post-war society. We won our NHS, welfare state and free education, alongside trade union rights and workplace gains such as pensions, safety and a fairer share of the common wealth we create. We face that challenge again today, to offer hope and opportunity in the place of fear and desperation. It’s a constant fight against the values of those who now seek to claw back those victories under the guise of austerity. It’s austerity that has given the far right a platform, and austerity which must be defeated to take it away. That’s another fight — and, no doubt, demonstration — on another day. But on Saturday we joined in solidarity with our brothers and sisters here and across the globe in the fights they face daily for a life without fear, exploitation and oppression. Their fight is a fight for us all — and one we must win on our journey towards a better world. A version of this article first appeared in the Morning Star on Saturday (March 16).